In the tutorial, I will show you creating Bootstrap tabs with default color scheme as well as using customized CSS to let you match tab and its content according to your web site’s design. Let me start with a simple example of Tabs in Bootstrap. For the basic demo, I have created tabs by using the unordered list <ul> tag of HTML with built-in Bootstrap classes. First of all, two libraries are included in the head section of demo page. One is Bootstrap JS library. 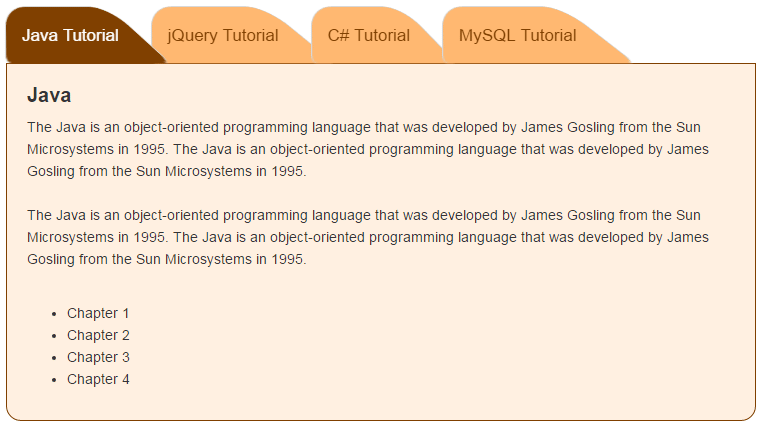 You also need to include jQuery library. I have used the CDNs for both. You also need to include the Bootstrap CSS file in the <head> section that contains the classes related to tabs as well as other components. The <ul> is assigned the nav and nav-tab classes, that are built-in. Use the .active class in a <li> tag that you want to open as the web pages loads. I used it in the Home tab. Each tag is activated by using the data-toggle=”tab” in each <li> element, that represents a tab. Each <li> is also given an id which is used in the content / tab-pane of each tab. It represents the “Home” tab and so on. You ca also use other HTML elements like <p> tag rather <div> for tab content. You can see the complete code in the demo page’s code section. In this example, I will show you how to change the default look of Tabs of bootstrap by using CSS classes. Basically, I have overridden the default classes of Bootstrap CSS to custom properties. For example, the nav-tabs class is used to change the background color of the main container of tabs. To make this style work, you have to place this style after referring the Bootstrap CSS. If you are using an external CSS file for your website and included that file above the Bootstrap CSS then changes will not work. In above example, only tabs CSS is customized. In pro websites, you may need to change the content area as well where Tabs information is displayed. For example, adding a border or background color etc. This demo is using the same number of tabs as in above example. However, the content area or tab pane is also customized with CSS properties. You may adjust the width accordingly. Also, the border-bottom property of the active tab is kept transparent to merge it with the tab’s content background color. For the demonstration, I also used <li> tags inside the “Java” tab that means you can use the different type of content in the Bootstrap tabs. The following example is a replica of the above demo, except I added the fade in class to the active tab and fade to the other tab-panes. You can see the fading effect as you click from one tab to another. To see another style and how to customize CSS for this tabs style, visit this tabs tutorial. You may also add dropdowns in Bootstrap tabs that display its own content. This may be useful for situations where you have sub-section for the main tab or web page space constraints. For adding a dropdown in tabs, you just need to include the dropdown related classes. I have written a detailed guide for adding the dropdown in tabs: Adding dropdowns in tabs of Bootstrap.